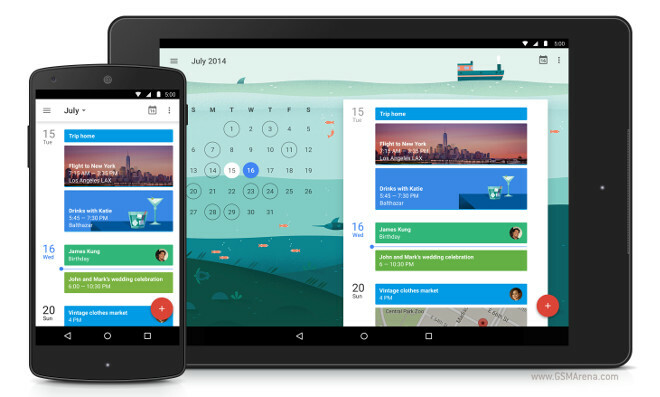 The Google Calendar app for Android is the latest to get filled with Material Design. But its newest update is also packing a few new features, so it’s not all about the looks. The new app is available today on Android 5.0 Lollipop – or, specifically, on the HTC Nexus 9 tablet, which so far is the only device to run the latest version of the OS. The app will, however, work on all devices running Android 4.1 or later. It’s expected to make its way to the Google Play Store “in the coming weeks”. Aside from the Material Design touches that have been introduced by Google in all of its recent app updates, the new Calendar will automatically turn Gmail emails into calendar events. This will happen, for example, when you book flights, buy concert tickets, or make hotel reservations – all the relevant details (such as flight numbers and check-in times) will be added to the calendar event that’s auto-created. The Assists feature suggests event titles, people, and places as you type, and it even adapts to your preferences in time. Finally, the new Schedule view includes photos and maps of the places you’re going to, or cityscapes for travel destinations, and illustrations for “everyday” things like dinner, drinks, yoga, and so on.